After bringing back the Golden Age Flash in Flash #123's memorable Flash of Two Worlds, Gardner Fox followed up with Flash #137's Vengeance of the Immortal Villain. 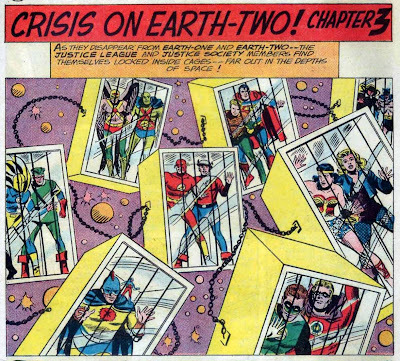 In that story, Vandal Savage, a major Golden Age villain, had captured the former members of the Justice Society of America and the two Flashes rescued them. 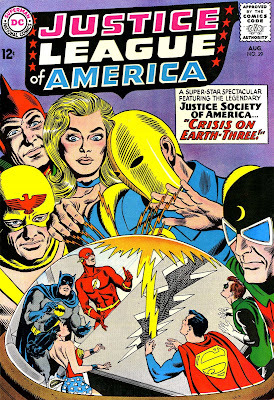 The Golden Age and Silver Age Flash teamups had become an annual tradition by that point, and it was only natural that DC extend the concept to a JLA/JSA teamup, which they did starting with Justice League of America #21-22, the August and September 1963 issues. This was significant in that I believe it was the first time a DC story had covered two complete, book-length issues. DC had experimented with continued tales before, but always in their anthology comics, so that the stories were not book-length. In that first tale, Golden Age villains The Icicle, The Fiddler and The Wizard teamed up with the Silver Age baddies Mr Element (the pre-reformed Al Desmond), Chronos and Felix Faust. The Fiddler had appeared in Flash of Two Worlds, so he became the first GA villain to make two appearances in the Silver Age. One notable oddity about the GA/SA characters; DC revived the heroes in new costumes and identities, but there were very few cases of DC bringing back GA villains as new SA characters. I'm wracking my brain here and the only one that comes to mind is at the very end of the SA, the GA Hawkman's villain the Gentleman's Ghost popped up as a new villain for Atom and Hawkman. Anybody? I'm not talking about just the return of the GA villains (like Mxyzptlk or the Penguin) in the SA, I'm talking about new villains roughly based on the GA villains but as recognizably different as Jay Garrick and Barry Allen, and therefore as new as the Barry Allen Flash. Anybody? Note in particular the SA heroes presented and the ones that lack a real GA counterpart. At the time, DC still had not quite embraced the concept that there was a difference between the GA Superman and the SA Superman. Ditto with Batman, Wonder Woman, Green Arrow and Aquaman. What do those five characters have in common? 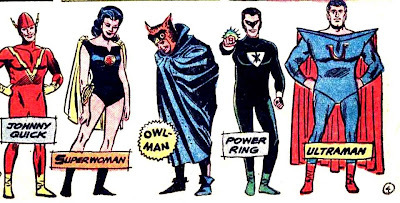 They were the only five DC superheroes to be published continuously from the 1940s to the 1960s. Of course the Martian Manhunter lacks a GA equivalent as well, but he was a strictly new SA character, not a revival. It was easy for DC to say that there were two Green Lanterns (in fact there were a multitude of them), or two Flashes; it didn't take a genius to tell the difference between Alan Scott and Hal Jordan. But with Batman or Superman establishing a dividing line can be extremely tricky, as DC would discover over the years. DC would eventually accept the idea as we shall see in later instalments. Next in this series: If there's an Earth-1 and an Earth-2, can Earth-3 be far behind? I've talked a little bit about American Comics Group, a small publisher that managed to put out about 1,150 comics from the late 1940s to the late 1960s. They put out comics in just about every genre, from teen to romance to funny animal to war. 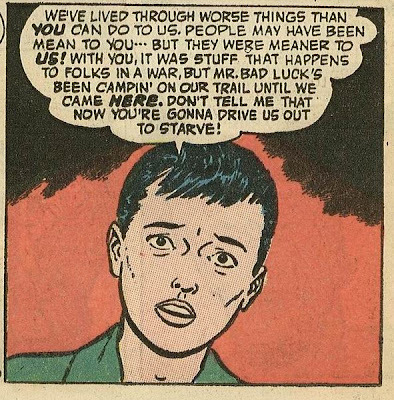 But their specialty was the kind of light fare that passed for horror in the Silver Age. Unknown Worlds was a late entrant for AGC in the horror field, coming on the heels of their long-running Adventures into the Unknown and Forbidden Worlds comics. 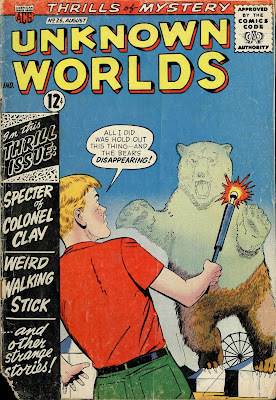 I thought I would take a detailed look at one issue of Unknown Worlds from August 1963. The opening story is entitled "The Specter of Colonel Clay". William Ames' family is forced to abandon their Oklahoma farm during the Depression. They decide rather than head to California like everybody else is doing, they'll go southeast. After an angry experience with a farmer who wants them to live in old slave quarters, they find an abandoned antebellum mansion which they hope to fix up and farm. But the mansion is haunted, and they are nearly killed a few times. The colonel is of course unable to resist the little tyke's pleas, and they become friends and opponents across a checkerboard. He helps out the boy's dad when some young toughs decide to take over the farm, and in the end he realizes his hatred is misplaced and he joins the rest of his family, at peace in the cemetery. The second story is "Gentle Brute". A husband and wife team of anthropologists come across a hidden valley where cavemen and dinosaurs live. They help a caveman, and in turn he saves them from a tyrannosaurus rex, teaching them that cavemen were capable of noble feelings. The artwork on this story was by John Forte, at the time in the middle of his run on the Legion of Super Heroes. "Tiny Mermaid" is a one-pager. A girl and a guy discover a mermaid in an seashell, but then a tidal wave washes over them so that they have no evidence. In "Weird Walking Stick", a UFO is shot down in a cornfield. A hayseed manages to pull a strange, glowing stick out of the flying saucer. It has odd powers and seems to automatically do whatever its owner desires. However, it is stolen by a greedy carnival operator whose use ends up destroying the stick. 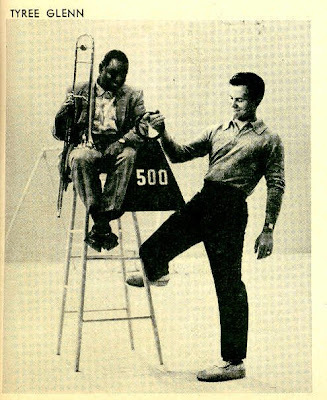 Pat Boone was seemingly made for DC, with his squeaky-clean earnest image. From 1955-57 he recorded several #1 hits. In 1959 he branched out into TV and movies, with a memorable performance in Journey to the Center of the Earth. He also published a self-help guide for teenagers called Twixt Twelve and Twenty. DC, sensing a hot property, decided to create a comic book about him. Well, sort of. 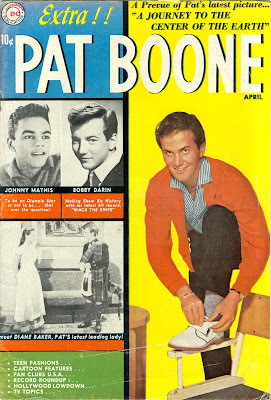 Pat Boone was more like Tiger Beat for the 1950s. It had way more text than any comic of the time with features on hot upcoming stars (and teenage girl heart throbs) like Paul Anka, Frankie Avalon, Jimmie Rodgers. 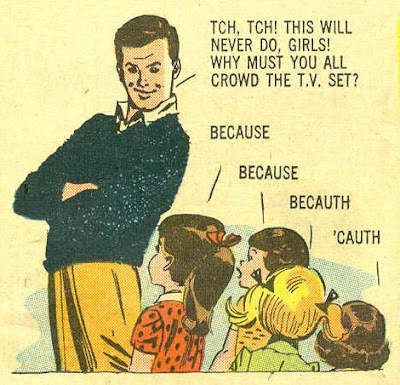 It had comic stories but they didn't feature full word balloons, instead just lines to the text, much like Doonesbury. They also had features on dating, fashion, and Pat even contributed an advice column. 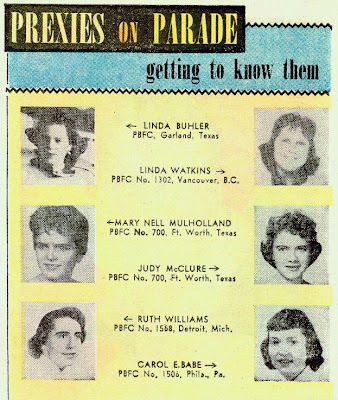 We also met some of the Pat Boone Fan Club "Prexies on Parade". There were five issues in all. Why didn't it last longer? I suspect there were a couple of reasons. First, although Boone was only 25 and had recently graduated from college, he was also a very married man with four daughters. 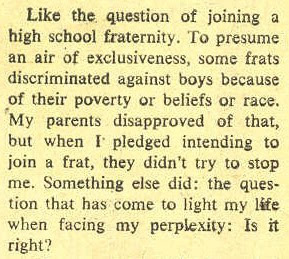 And second, the hits just stopped coming, at least in 1959 and 1960. Note in particular that phrase "light my life"; his daughter Debby would years later have a monster hit called "You Light Up My Life".